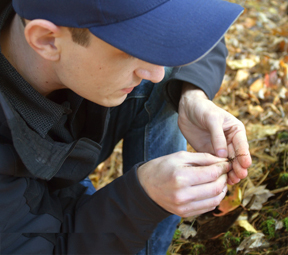 UNTIL RECENTLY, Matt Vadeboncoeur's Ph.D. research has focused primarily on very specific, small-scale, and somewhat narrow questions about ecosystems. 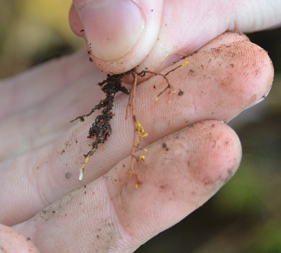 Indeed, that aptly describes his particular interest on plant uptake of organic nitrogen and mineral forms of phosphorus and calcium as mediated by mycorrhizal fungi, which form a symbiotic relationship with the roots of certain vascular plants. So it's a pretty big leap to take that same avenue of research and scale it up to the level of policy discussion about the potential to increase the use of local forest biomass for energy production in the Northeast. 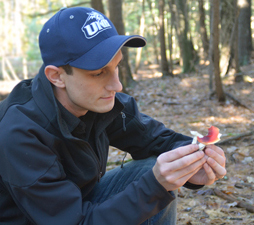 Matt Vadeboncoeur looks for mycorhizal fungi in UNH's College Woods. Yet that's exactly what Vadeboncoeur is doing, and the shift in focus helped land him a 2011 Switzer Environmental Fellowship from the Robert and Patricia Switzer Foundation for emerging environmental leaders. The one-year, $15,000 fellowship was awarded to just 20 U.S. students who are pursuing graduate degrees and are dedicated to working towards positive environmental change in their career work. The fellowship will help Vadeboncoeur bridge the research and policy worlds. "In the past few years my focus has broadened and I've been trying to think about these specific findings on what's happening in the soil and how they can relate to broader policy discussions going on," Vadeboncoeur says. 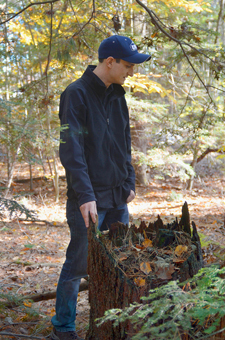 Specifically, he's been looking at his research in the context of wood bioenergy in New England. This was a central element of his application for the Switzer fellowship. "This is a topic of conversation that is happening at a number of different levels, both political and scientific, and about all different aspects – the economics, the potential scale of harvest, and, over the longer term, what the ecological consequences might be," he says. "And that's where I have some prior research that I realized would very much apply to the policy discussion. I knew I could look at the science in a different light and examine what the long-term consequences of intensified harvesting would be with respect to just the nutrient cycle – the limiting nutrients in the forest." Is it tough to scale up such minutiae to a meaningful level for so big a policy question? In a word, yes. "There's never really enough data to make such broad statements, so the approach I've been taking is to start with what we do have and just put some bounds on what we think the long-term behavior of the system might be under different conditions. And I'm also looking at how that varies across just the landscape we study, which is obviously a subset of the much larger landscape in the region." 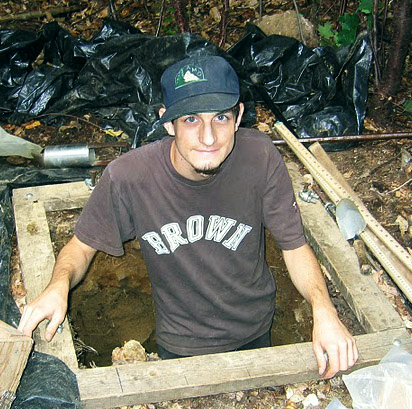 Matt Vadeboncoeur excavates a quantitative soil pit in a young regenerating forest stand near the Bartlett Experimental Forest in Bartlett, NH. Photo by Colin Fuss, Syracuse University. For his research, Vadeboncoeur has spent several summers leading field crews in soil and vegetation sampling at the Hubbard Brook and Bartlett Experimental Forests in the White Mountain National Forest. He is also involved in tropical forest research in Taiwan and Malaysia. 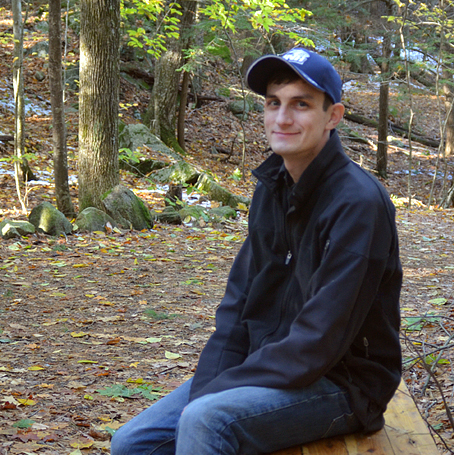 Vadeboncoeur is a Ph.D. candidate in the Natural Resources and Earth Systems Science program. His advisor is research associate professor Erik Hobbie of the EOS Earth Systems Research Center. Hobbie specializes in using chemical isotopes to understand carbon and nitrogen cycling in forest ecosystems and is particularly interested in understanding the importance of mycorrhizal fungi in forests, both as a carbon sink and as a source for nitrogen. Using data from experimental forest sites, Vadeboncoeur and colleagues can model different scenarios of harvesting at various intensities over time to see how that would play out in terms of depleting nutrient stocks. The same can be done using data from sites with richer soil nutrient supplies to see how differently the forest might behave. And, indeed, one of his main findings has been to show there is a big difference among sites. "If you look at these sites today, you see forests that are healthy and regenerating well in the wake of harvests of different intensities, but the modeling shows that if these same forests are harvested a few more times those trajectories might really start to diverge," Vadeboncoeur says. "So, we have to figure out what specific things need to be measured and monitored if we're planning to really intensify harvesting as an energy source. And the idea behind that is sustainability, which implies a long or very long-term time horizon. How do we address that? What are the remaining important scientific questions we need to look at on that scale?" Russula fruiting body, which is mycorrhizal. "That's something that isn't very well studied. 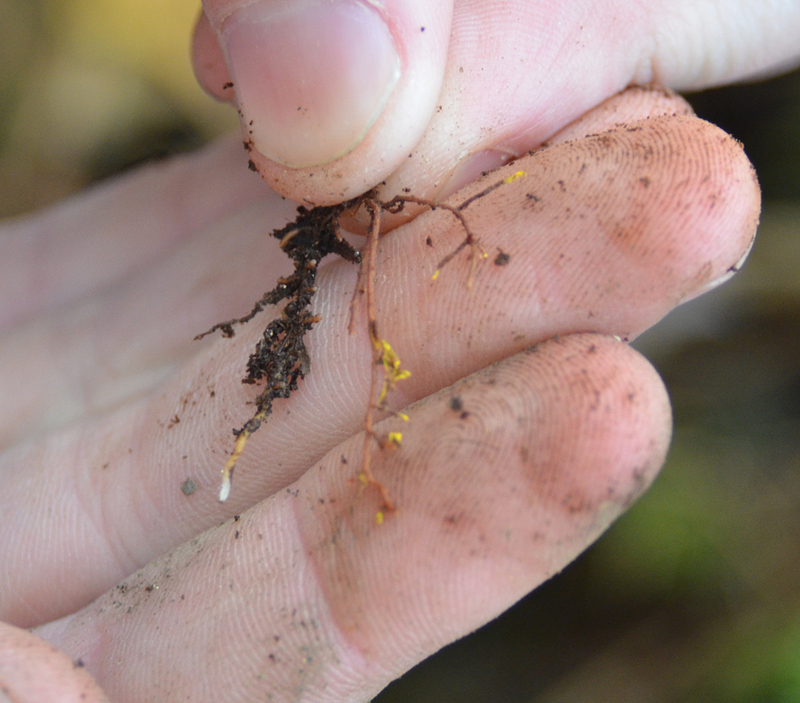 So in terms of what I'm working on, that's kind of the bottom line – setting up why it's really critical over the next few decades to focus on this fungal weathering mechanism as a way to better understand these long-term nutrient cycles." But he notes this is a difficult area to investigate in part because there hasn't been a lot of work done developing isotopic tracers that can be used in the field. Most of the work done to date has been in greenhouse studies using soils in pots under conditions that are not very realistic. "Such approaches don't tell you much about the real world, which is very messy and everything is mixed together in the soil. You're not able to get at key questions: What's the rate at which that weathering is actually happening and what controls it? If the plants become more phosphorus limited can they up-regulate the phosphorus weathering rate to access more or not? We're still not quite sure how to answer these questions in the field." He adds, "It's difficult, because you're looking for a small signal in a big cycle, a small input into something that's constantly recycling anyway. We know that over the long-term that small input really matters, but over the short-term it's very hard to observe." With the Switzer fellowship in hand, Vadeboncoeur hopes that the policy relevance of certain questions will guide his research going forward. He notes that it's not always a very direct step from a very specific research question to broader policy perspectives but, he says, "I definitely want to make sure that, over my career, I'm engaging with that process and that science isn't something just left on the shelf or separated intellectually from the critical and sometimes time-sensitive questions debated in the more public sphere." The fellowship is already helping matters on that front to some degree. At the Switzer retreat in Essex, Mass. for this year's new fellows, communication and mentoring training, professional development and networking was the emphasis. "It was about getting people to think about bridging the gap between doing science, or whatever people are doing in their fields, and also making sure they're more comfortable playing a role in society, especially communicating results of science effectively as opposed to letting it just circulate in academic circles." The Switzer fellows network includes people from a diverse spectrum – from working exclusively in an advocacy realm to very heavily in the science side of things. Vadeboncoeur believes that strengthening those connections is critical if progress is to be made – making sure, for example, that people working in an NGO trying to advocate a particular policy position are well connected to the scientists who have the current research relevant to that field.